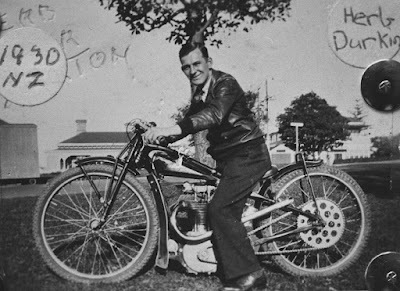 -SG- Leon is Australia has forwarded this photo of Herb Durkin - about whom there's a fair amount on the Internet, worthy of a quick read - seated on a 1930 DT Norton. The photo is via the Herb Durkin Collection of David Dumble in Melbourne. I was on the point of mentioning that only one DT Norton shows in the records as having been sent to Australia when I had another look at the photo - from which it seems quite likely that it was taken in New Zealand where perhaps Herb was on a visit at some time. Be that as it may, the photo shows quite clearly the through bolts holding head and barrel to crankcase and, not quite so clearly, the hexagonal exhaust nuts threaded into the exhaust ports, both features of the production DT Nortons. Please don't contact us with questions if you find it difficult to say "Thank You"
All materials Copyright John de Kruif / Simon Grigson or contributors; please ask and we'll direct you to the owner. We do our best to include accurate information but make no assurances as to the accuracy or completeness of the information provided. The owners of this site shall not be liable for any damages or injury resulting from your access to this website, or from your reliance on information provided at this website.